Taking place until Sept 7th at the Canadian National Exhibition in the CNE Arts, Crafts & Hobbies Pavillion is a one of a kind art, craft & hobbies show. Here you'll find a few of our very own Artfest artists/artisans exhibiting their wonderful works of art and 'distinctive Canadian collectables'. 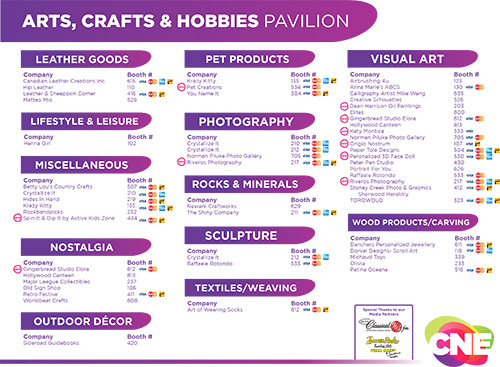 The Arts Crafts and Hobbies Pavilion showcases 63,000 square feet of collectibles, including art, crafts, clothing, hobbies, specialty foods, home wares, jewellery and leather goods. The building is now open and running until Sept 7th with a huge selection of Canadian collectables available to purchase. Mark Kuper. from the Art of Nova Scotia (who will be handing out our Artfest Flyers - thanks Mark, you rock), Reiners Ottomans, and Forks & Fashion! Skinlicious Body Care, Kul Werks, Embody, Olioeco Organics, Dean Harrison Oil Paintings, Michaud Toys and The Wandering Bean Coffee Company. Download the CNE Art Show PDF to see the full list of exhibitors! "Let's go to the EX!" Posted on August 31, 2015 by Lory MacDonald and tagged CNE Art Show.